Nowadays is quite easy to meet new people, discover friends from all around the world and even find the perfect match for dating with the right chat app. There are many chat apps created for anyone’s needs and taste. For all Arabic users that like to chat with others without showing their faces, sending just voice messages and connecting with people nearby or worldwide, we have found an incredible voice chat that offers them all this and more. Let’s see what the Halu app offers you. What is this voice chat about? This voice chat is developed on the Android platform, especially created for people from the Arab world that like to connect with other Arabic users to chat, meet a new friend or even find their perfect match for dating. This is an amazing 1 vs 1 voice chat app, simple and user-friendly that allows you to send voice messages to others and chat with anyone you like without showing your face. Meet interesting Arabic people and discover new friends nearby, never feeling lonely again. Simply by clicking ‘’Start Matching’’, the app will get you the perfect person you can share your thoughts and feelings with. Why do we choose HALU? Halu does not require videos or filters, you need to just relax and chat with anyone of your choice and make good friends with it. 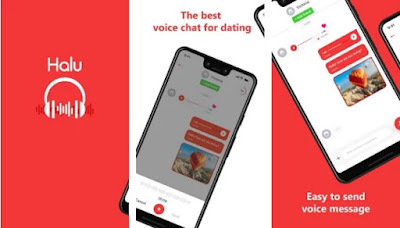 The app offers accurate calculation to get you matched with the person that suits you the most and you can send to that person voice messages to chat. To enjoy unlimited voice chatting and get every feature from the app, you need to just subscribe. Without showing your face, talk to anyone you want to, find new friends and meet your perfect match for dating. Also, send photos and text messages and if you like you can open chat rooms too. The distance between you and the other user can be checked on the app and you can also see if the user is online or offline. Create a profile and add information and photos on it. Check the profiles of other users easily as well. Block or report annoying users on the app, meet new people nearby or all around the world, men and women, chat with over one million users. Send instant messages, arrange meetings, finding single people to date and making friends with other Arabic users. Download this app on Google Play for free now to easily meet new people from the Arab world to chat with!